Triple layers of flowers and polka dots. This is black and lime green colors all stacked into one great bow. The bottom layer is a 2.25" black grosgrain ribbon, with a 1.5" lime green bow stacked on top. 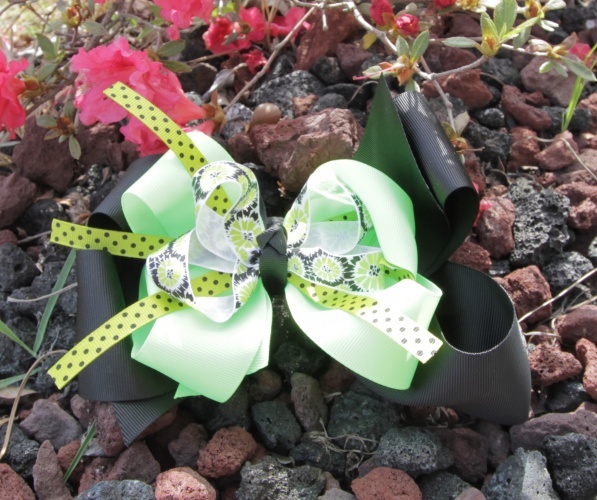 A satin 5/8" ribbon that has lime green burst flowers with black etchings tops off this bow. Three strips of a 3/8" lime green with black polka dots ribbon run through the center of this bow. This is a fun and bright bow that will liven up any outfit.